In my continued effort to eat healthy and avoid the pitfalls of the common north American culinary experience (re: fast food) I’ve been doing my best to not get suckered into going to lunch with work folk as it inevitably leads to some brand of unhealthy eating. Sadly my will power is not always the best and yesterday I was convinced to go to Taco Bell. 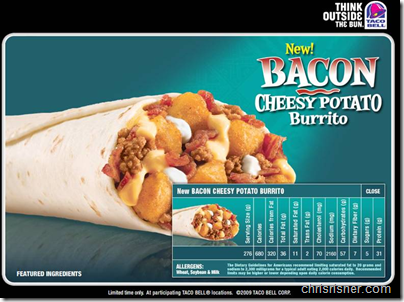 Upon arriving at the newly remodeled Toxic Hell, I was greeted by a particular brand of evil: the Bacon Cheesy Potato Burrito. 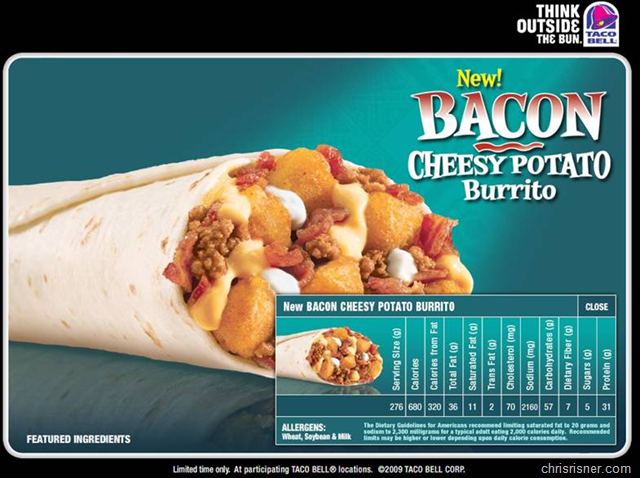 It was as if someone had ratted out my penchant for bacon to the creative department of TBell and they threw together a ferocious feast just for me. Alas, I succeeded in avoiding this and stayed on the Fresco menu (yeah, it was SOOOO much more healthy, I know). Later in the day though, my friend PJ informed me that he had just had a Bacon Cheesy Potato Burrito and that it was essentially orgasmic. Perhaps I’ll get drunk enough to try one of these beauties before they are lost to the menu. Submit to the dark side Chris! Eat the bacon! Please never eat one of those. Ever. Gross. I would recommend sticking to drunken Jimmy John's. Perhaps some combination of bacon and jimmy johns!